At the North American International Auto Show (NAIAS) in Detroit, Porsche is presenting the latest generation of the extravagant 911 model to the public. This model is the first to combine the classic Targa concept with state-of-the-art roof technology. the legendary original Targa model, the new model features the characteristic wide bar in place of the B-pillars, a movable roof section above the front seats and a wraparound rear window with no C-pillar. But unlike the classic models, the roof segment on the new Targa can be opened and closed at the push of a button. At the press of a button, the fully automatic roof system stows the convertible top behind the rear seat system, providing a real spectacle. The rear-weighted design of the PTM all-wheel drive fitted as standard is a typical Porsche feature, and guarantees that this latest 911 model also offers optimum driving dynamics on all road surfaces and in all weather conditions. With these features, the new 911 Targa is presenting itself as a high-quality, innovative remake of the classic vehicle from 1965. The model shares a great deal in common with the 911 Carrera 4 cabriolet models, such as the window line and technology. The combination of the wide rear end that is typical of all-wheel drive models, the Targa bar and the dome-shaped rear window gives the latest 911 an extremely sporty appearance and a low-slung profile. 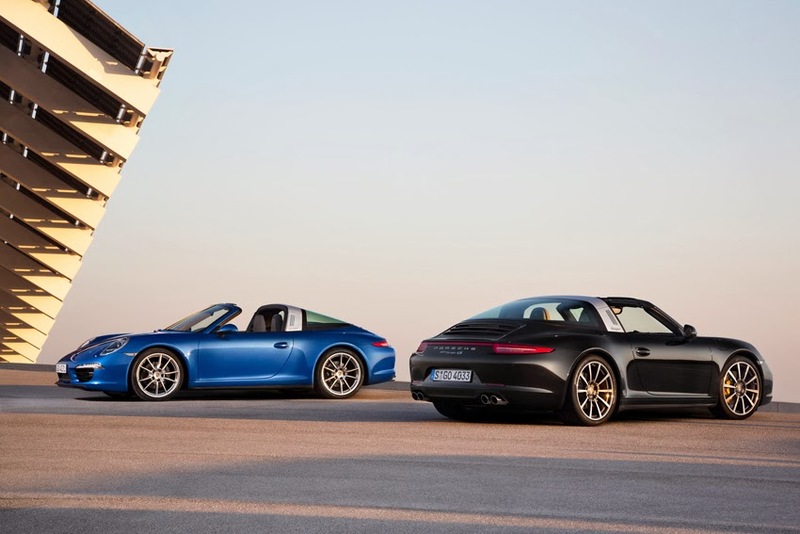 As with the predecessor model, the new Targa generation comes in two versions available exclusively with all-wheel drive. The 911 Targa 4 is powered by a 3.4-litre, 350 hp flat engine. When equipped with the Porsche Doppelkupplung (PDK) and Sport Chrono package, this model accelerates from zero to 100 km/h in just 4.8 seconds and boasts a top speed of 282 km/h. Its NEDC fuel consumption figures are between 9.5 and 8.7 litres/100 km, depending on transmission, which corresponds to a CO2 emissions level of between 223 and 204 g/km. The top model is the 911 Targa 4S, which delivers 400 hp from a displacement of 3.8 litres. This model reaches a top speed of 296 km/h and, when equipped with the PDK and Sport Chrono package, accelerates in 4.4 seconds. Its fuel consumption fluctuates between 10.0 and 9.2 litres per 100 km, depending on transmission, which corresponds to a CO2 level of between 237 and 214 g/km. With these figures, the model is on a par with the high standard set by the 911 Carrera 4 cabriolet models in terms of engine, road performance as well as efficiency. The new 911 Targa 4 and Targa 4S models are available for order as of now, with first units being delivered in May of 2014. Basic retail prices will be announced soon.